What’s the difference between spot metering and single point autofocus? It’s a bit confusing when you’re unsure of how to use a DSLR and start moving away from auto everything mode. You look through the viewfinder, you see a little square or something similar and you know you need to focus on something, but you also need to do something with the exposure. Or maybe you look through the viewfinder and see no little square. How do you focus on something or measure the light? That’s when the confusion sets in and everything you knew becomes a bit tangled. I do photo walks with beginner photographers, which is a great way to learn, as I teach while we walk and shoot. Someone will see something they want to photograph and I am on hand to answer composition and technical questions to help them get the shot they want. It also keeps me connected with the challenges faced by newcomers to photography. When you’ve been photographing for quite a while, it is very easy to forget what it was like when first confronted with all the options on a DSLR. It’s great to have options, but it can also be really confusing. On a recent photo walk I was asked what’s the difference between spot metering and focusing. I was a bit stumped by the question, because to me it seems obvious that they are two completely different things. I’d forgotten that, to somebody learning photography, it is not at all obvious. 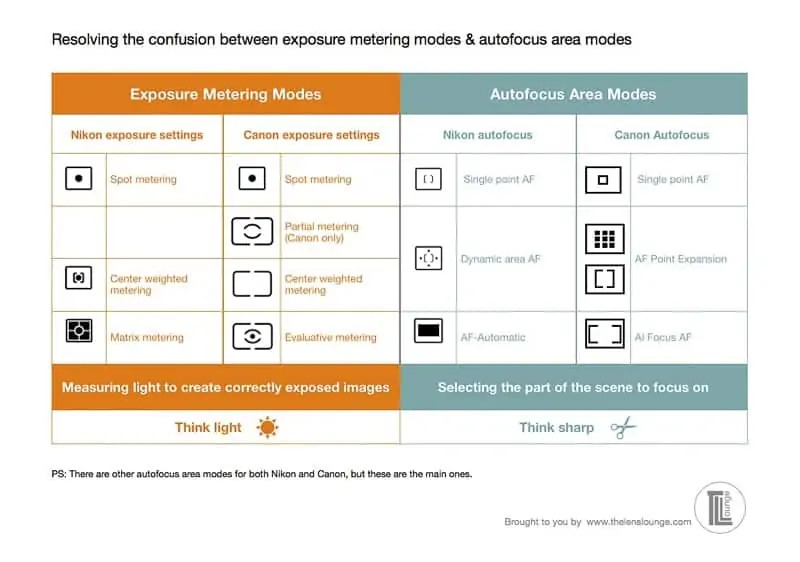 Here’s a handy cheat sheet to help clear up the confusion between exposure metering modes and autofocus area modes. It’s the same as the one you can see further down in this article with further explanations. Enter your email to grab your FREE cheat sheet and weekly tips. Then it dawned on me. When you’re looking through the viewfinder, trying to autofocus, as well as measure the light for the exposure and there’s only one little square…well, how can that be doing two different things? The short answer is that it’s not. You’re simply looking at it for two different reasons. Also, we’re talking about autofocus, not just focus, because we weren’t focusing manually. I’ll explain in a minute. I asked him what autofocus area mode he was using. He looked at his camera, a Nikon D300, and said the one with the dot in the middle. That’s single point autofocus. I asked him what exposure metering mode he was using and he replied that it was the one with the dot in the middle. That’s spot metering. The teeny tiny icons on the camera for both settings are a dot or square in the middle of a square. They look really similar, especially when they’re so small. Also, when you look through the viewfinder you just see one small dot or one small square. When I arrived home I Googled to see if this was a common question. I found a number of photography forums where people were asking what is the difference between spot metering and single point autofocus. They were confused about the difference between exposure modes and autofocus area modes. I figured that this must be something that’s tripping up quite a few beginner photographers. 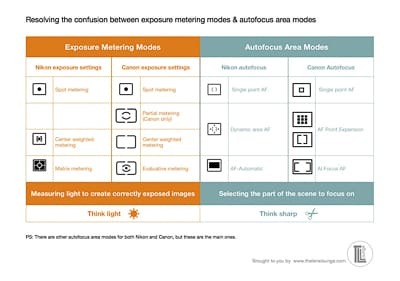 The first point to note is that exposure metering and autofocus area modes are two completely different functions. Exposure is all about how light or dark the scene is. Focus is all about deciding what part of the image you want to be sharp and then aiming at it. Secondly, I think the icons used for exposure metering modes and for focus modes look like they could mean the same thing. Here’s a table of exposure metering mode icons and autofocus area mode icons for both Nikon and Canon. That clears up the icons. They look kind of similar, but they do very different things. To explain the difference between spot metering and single point autofocus, as well as the other exposure metering and autofocus area modes, I thought I’d answer the most common questions on exposure and autofocus I’ve seen in forums. 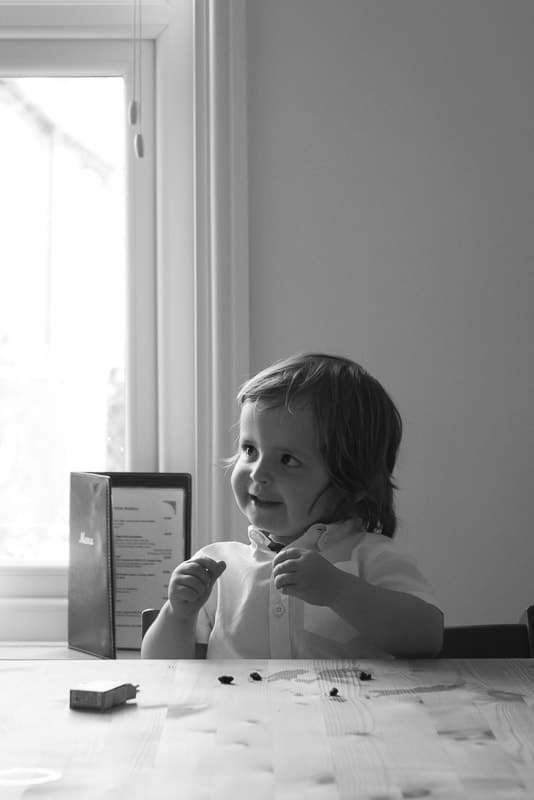 Question 1: If I select spot metering, does the camera select the same point to autofocus on? Answer: No. You select your autofocus area mode. It could be single point autofocus, dynamic area autofocus and autofocus auto area for Nikon. For Canon you could choose single point autofocus, autofocus point expansion or AI focus autofocus. Selecting your exposure metering mode and focus area mode are two separate functions, controlled by different buttons. The confusion sometimes arises, because with spot metering the area around the focal point is the area that is being metered. Word of warning. Not all cameras have moveable spot metering. All Nikons do and some Canons do. Check your manual to see if your camera model does. If the spot metering is not moveable, the camera meters the exposure from a very small area at the centre of the frame. Use the square / point to measure the exposure first. On the basis of the reading, in manual mode, set your aperture and shutter speed. Or, in aperture priority or shutter priority modes, set either your aperture or shutter speed (depending on which mode you’re in) to your desired setting. Press and hold the AE-L / AF-L button to lock the exposure. Position your focus point on the part of the scene you want in focus and depress the shutter button part way to focus, then fully to take the shot. Question 2: If I use spot metering, which autofocus area mode should I use – is the spot an autofocus point? Answer 2: You can use any autofocus area mode with spot metering. The spot only doubles up as an autofocus point as well when using single point autofocus. Just because the square you’re looking at is the same for both functions, don’t be fooled into thinking exposure metering modes and autofocus modes are the same. You still use different buttons to operate the different functions. You could use spot metering and autofocus auto area mode. In which case the camera will decide on where to focus, but will use the exposure readings from your spot metering, the small square you see in your viewfinder. Likewise with dynamic area autofocus (Nikon) and autofocus point expansion (Canon), which are ideal autofocus area modes to use when photographing movement. The area around the focus point locks on and tracks the subject. How much of the area depends on your setting. Measure the exposure first by pointing your camera at the subject. Or, in aperture priority or shutter priority modes, set either your aperture or shutter speed (depending on which mode you’re in) to your desired setting. Depress the shutter button part way to focus, then fully to take the shot. Question 3: If I move the square / spot to meter a part of the image, would this change the autofocus point to that part of the image? Answer: Yes, if you’re using single point autofocus and dynamic area autofocus (Nikon) or autofocus point expansion (Canon). No, if you’re using automatic autofocus area (Nikon) or AI focus autofocus (Canon). Question 4: When is the spot not used for metering exposure? If using center weighted metering, the center of the image is metered, regardless of where your focal point is. This is also the case for matrix or evaluative metering, where the exposure of the entire scene is metered. Question 5: What is the point of using different exposure metering modes? Answer: Different situations require different ways to measure the light. Spot metering off the person’s face measures just the light on the person, so they will correctly exposed and the bright background will be overexposed. Center weighted metering measures the middle of the scene, so the bright background will be slightly over exposed and the person will be slightly under exposed. Matrix / evaluative metering measures the entire scene. The bright background will be bright and your person in shadow will be underexposed. 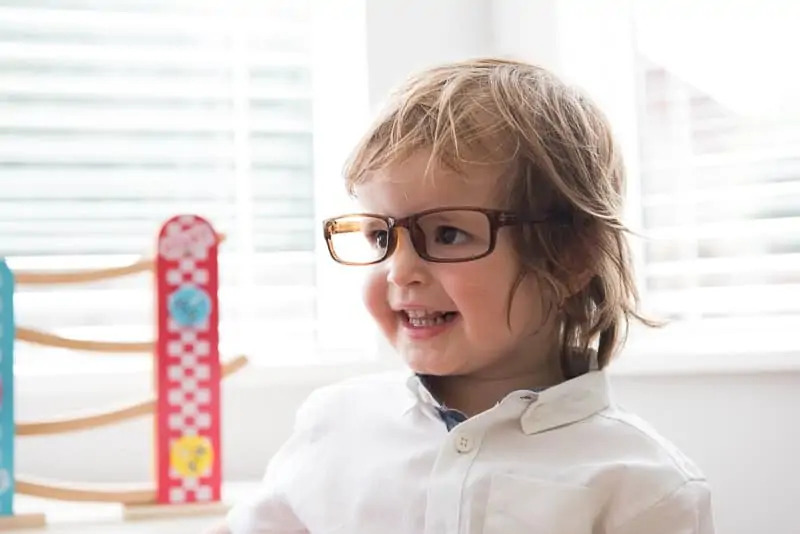 Spot metering (pointed at the lit side of his face) was used to meter the exposure for the image above to ensure that the boy was correctly exposed. In the image below, matrix metering was used so that the mother and her baby would appear as silhouettes. Question 6: What is the point of different autofocus area modes? Answer: Different situations require different ways to focus on your subject. Single point autofocus focuses on a very specific part of the image – the eye of your model, or the center of a flower. Dynamic area autofocus / autofocus point expansion tracks an area around the focal point to help maintain focus on moving subjects. Automatic autofocus area mode is for when you’re not worried about where the camera will focus, so you leave it up to the camera to decide what is important and needs to be in focus. Don’t do this – there’s a good chance your camera can’t read your mind, no matter how much you love it. For a deeper look at autofocus area modes, here’s some further reading: Nail your autofocus, get the shot! If you have any confusion on how to use spot metering and single point autofocus, let us know in the comments. Also, we love good news, so if our photography tips have helped you to understand how to work exposure metering and autofocus area modes, share that too. The Exposure Triangle – what role does ISO play? The Exposure Triangle – what role does aperture play? Has this tutorial help you to understand the difference between spot metering and single point autofocus? Great article. Your steps for using the different modes are easy to follow. Thanks! My pleasure, Rebecca! Thanks for the feedback. This is fantastically explained!!! Easy to follow and very thorough. Thank you!! Thanks, Jackie! That’s great to hear! Thanks for the great explanation. I have a question about spot metering and Single point autofocus. To meter correctly it is need to have the lens focused before metering or the meter just follow the direction of the focus point we see in the screen/live view? For example: I focus my lens on the left of the composition to a close subject, let’s say about 2 meters from the camera, with a shallow depth of field, then I spot metering to the right of the composition, without refocusing, to an object that is far away, outside the depth of field, so to a subject that is not in focus. Does the meter try to read the light at the distance where is my focus plane or does not care about the focus distance but just follow the direction of the focus till it reaches the far away subject on the left of the composition? Good question, which I get asked a lot. I’ve written a post on exposure lock that should help you if you want to meter and recompose. The short answer, as I understand your question, is that yes, the camera will constantly meter for where the focus point is. So if you move position, the camera will meter for the new position. You don’t need to be focused to meter. They’re two separate functions, which is why it’s confusing, because you use the same point to do both things. Try this – Hold up your camera and move it around without focusing on anything. Keep an eye on the exposure indicator and you’ll see it will change constantly as it meters whatever is in front of it. And again compliments for the great articles and website! Hurrah! So glad it helped you!